Peanut butter?! In a BURGER?! You read that right. 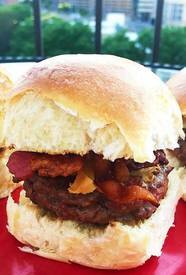 This venison slider recipe is definitely not your standard slider. Unexpected and delicious, creamy peanut butter is the condiment you never knew you needed in a burger! Crispy Bacon is also a key ingredient here. Add Bacon to anything and it just makes it that much better. So, I encourage you to step outside your comfort zone and try this non-traditional burger recipe. My bet is you’ll be pleasantly surprised.